A German climate researcher has discovered that the surge in solar radiation that began in 1700, peaked in 1960 and is still at historically high levels was far stronger and more significant than had previously been realized. 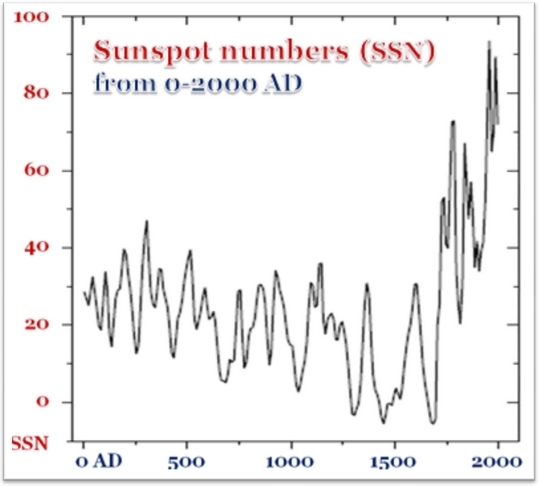 According to Dr. Horst-Joachim Lüdecke, who spent months comparing the varying widths of annual tree-rings and stalagmite deposits with recent temperature and sunspot records, this remarkable increase in solar activity was the real reason why the weather got warmer from 1950-2000. There has been no warming since 2000. Dr. Lüdecke reports his major discovery in the latest issue of the acclaimed climate-science journal Energy and Environment. His discovery is consistent with earlier results from Professor Sami Solanki in Finland, who reported in the journal Science six years ago that the Sun’s activity in the second half of the 20th century had been greater than during almost any similar period since the end of the last Ice Age 11,400 years ago.